I spent a lot of time on my images, created a template, so that the image selected on the post would display well on Facebook. It was working for the longest while, but this week, after applying the latest update from you, the images for Facebook are broken. It started using the Featured Image for the post, which is not setup for Facebook sizing. Before, I had an option to set my custom image under the post > All in One SEO Pack Pro > Social Settings > Custom Image. The option is still there, but it is not grabbing that Custom Image but the Featured Image. 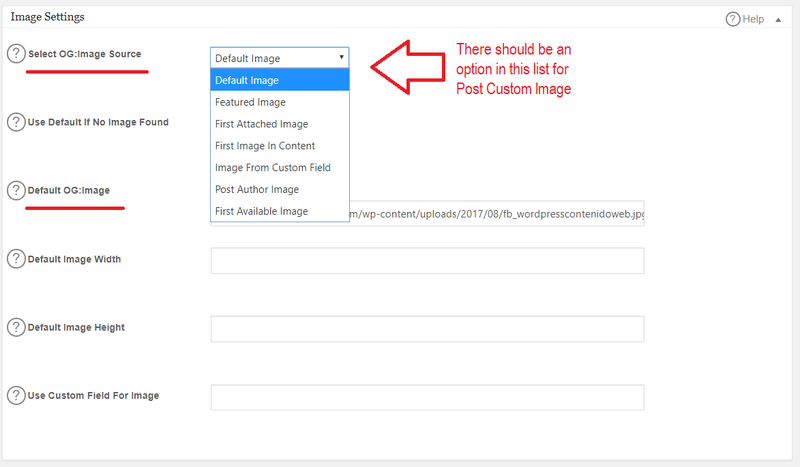 I have no option for Post Custom Image, for example, and none of these options display the image uploaded in the Post > Social Settings. Please help!!!! For now, my only option left to make it easy on managing my Facebook posts is to go to Social Meta, and under Image Settings choose, “Default Image” in Select Default OG:Image Source and change my Default OG:Image everytime I publish a post. I insist, this changed during the last plugin update. There should be an option for Post Custom Image that coincides with the image selected for each post/page under Social Settings.